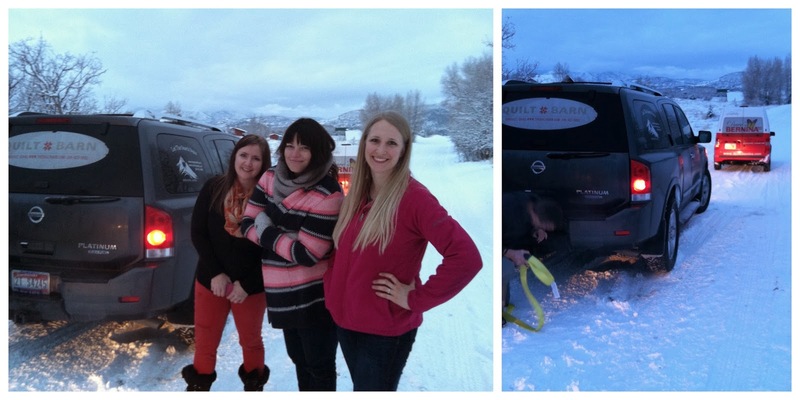 As I mentioned, last weekend I got to sneak away to the mountains to sew at a retreat called Quilt Bliss. It was heavenly. It was amazingly well-organized by Pam and her helpers from the Utah County Modern Quilt Group. I have been excitedly looking forward to it for weeks!! Just what I needed post-holidays – a little getaway time with fun friends, new and old, and time to catch-up on neglected sewing projects. The setting was spectacular. We’ve had little snow all of January, until the day of Quilt Bliss (of course) which gave everything a fresh dusting of white powder. Including the roads, which makes mountain travel a little more sketchy. Fortunately the folks from Dave’s Bernina and Heather from the Quilt Barn helped us out and we made it to our destination safely in the end. But it made for more of an adventure. And I have to share the sweetest, serendipitous moment here. Fortunately I wore my snow boots for the drive up (which are pretty comfy), but didn’t bring any other shoes or slippers and only a pair of ‘regular socks’ to wear each day. When we got to the lodge my legs and feet were wet from getting the car out of the snow and I was wishing I had something cozier to put on my feet while my boots dried by the fire. That’s when I saw Maggie who gave me a sweet little hand made bag and inside were some beautiful hand-knit wool socks! It was such a happy little blessing at that moment! Once we got there and got settled in our accommodations and enjoyed a gourmet dinner of salmon and pork loin (I’m not kidding) we got right down to business: sewing. I love being inspired by the gorgeous things people create. This was a little swap gift made by April. The details were amazing! I was asked to teach a class about organizing and using your scraps. (I love that topic. I finally started a Pin Board to keep track of my favorite Scraps projects.) I then demo’ed a strings-foundation-pieced quilt block (similar to this one). You can see mine in the picture at the top of this post. It’s not finished. I’m trying to decide whether to just add borders, or make more blocks. We’ll see… But loved seeing what the students in the class did with their scraps! I especially loved this one Andi made using selvage pieces! I just love Sherri. She is an amazing quilter, as evidenced by her enormous Dear Jane quilt. Sarah Jane Wright also came up Saturday afternoon and shared some of her creative journey with us. It was so inspiring! As you can imagine, it was great to get away for a few days. I was a little worker bee the whole time trying to catch up on a lot of projects and upcoming deadlines. Wifi was super spotty – which is both a good and bad thing too, right? (Katy snapped this pic of Sherri and I at lunch one day when I finally caught the first whiff of Wifi!) No instagram distractions 😉 but I felt like I came home to a lot of emails to catch up on. Still, totally worth it. 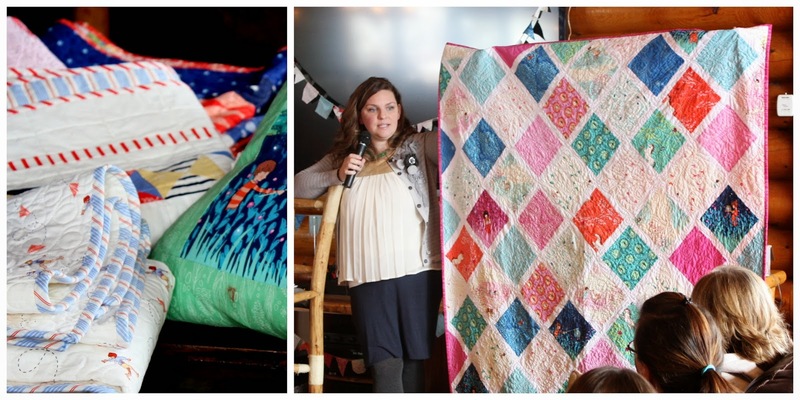 I hope Quilt Bliss will happen again. I am so there. It’s such a great to get away and sew with other people. Even if you can’t get away, just get together with some friends one afternoon, or join a local guild. I can’t believe how blessed I’ve been to find real-life-quilty friends. They (you!) are such a blessing! Looks like a fabulous retreat, blissful infact! Oh what a place for a weekend!!! 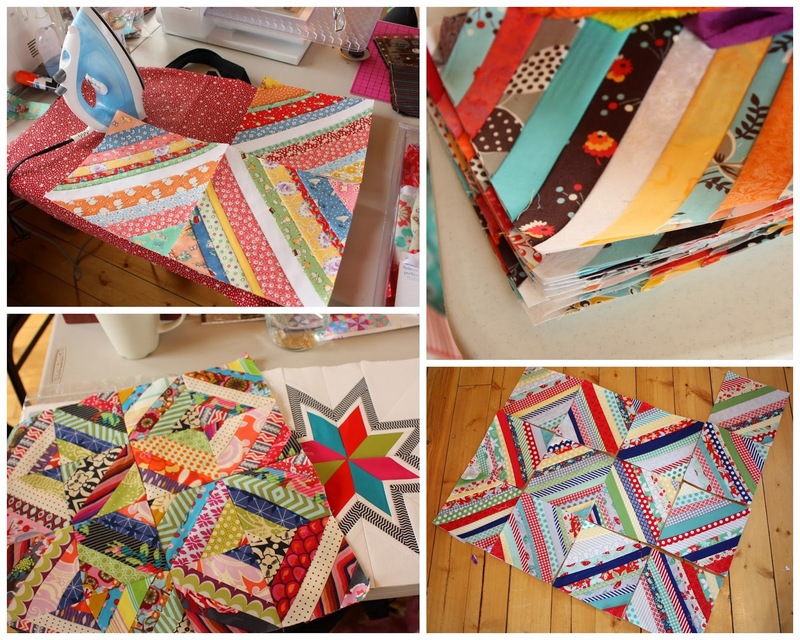 Such gorgeous quilts….love the scrap quilts…I&#39;m going to try that !!! I already saw pics on IG, it looks like a few days of heaven. And what a lovely venue. I hope for you all that it will happen again next year! Wow, looks like you had a lot fun! I love those string blocks! Looks like a happy group and some great show &amp; tell — how was it working at round tables? I&#39;ve always had a whole big table to myself at retreats — not sure I could stay politely confined? How aptly named! Looks like it was just terrific! Wonderful pictures! It was a great retreat and great meeting you! Yay to Maggie saving your toes!!! Beautiful quilts!dear Jane, the yellow Dresden, and of course it&#39;s obvious you had a great time! Congratulations! 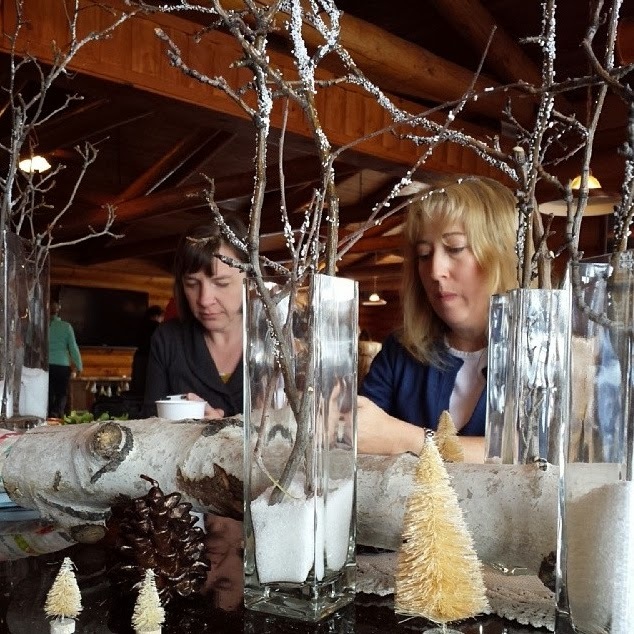 Oh what a lovely retreat , looks like a lot of fun ! Looks like a lot of fun. Gotta love seeing what others are working on their tricks. What an inspiring place to sew! Glad you had a wonderful time. I love quilting weekends away! What a beautiful setting you have (makes me homesick a bit). I just love those string blocks, you got a lot done. this looks amazing. I have never been to a quilt retreat and hope to get to one someday! Oh I want to do a retreat sometime!! Looks like so much fun! How fun and what great pics! 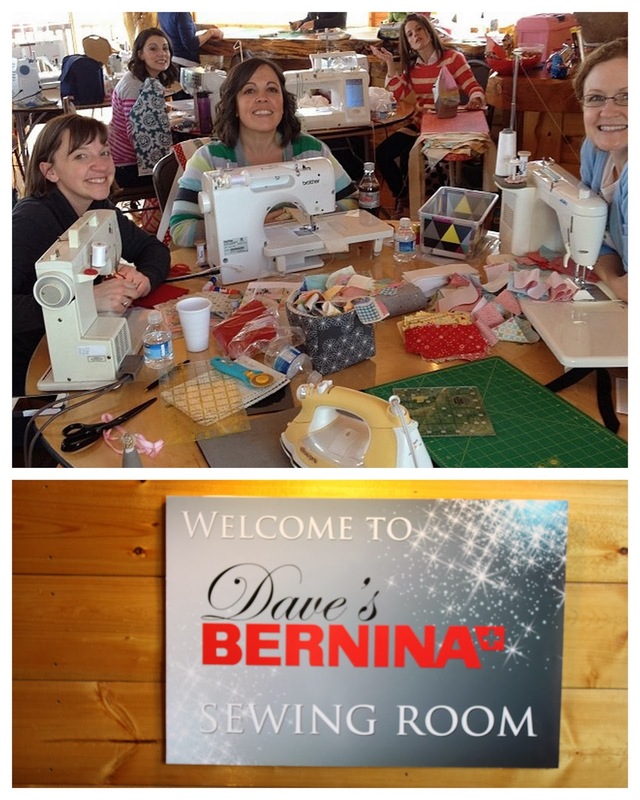 My friend&#39;s brother owns Dave&#39;s Bernina. They are great folks and I&#39;m glad they could help you out! Terrific recap, Amy! And thank you for the kind comments! Oh it looks absolutely perfect! Looks so fantastic!! I&#39;m super jealous! =D<br /><br />That Dear Jane, wow! Wow, what a lovely place to have a retreat! I can&#39;t think of a better place! I bet you had loads of fun! What a fantastic time all of you had! I heard great reports from Sherri and Jodi, too! Oh Amy — it looks like you had SO much fun! 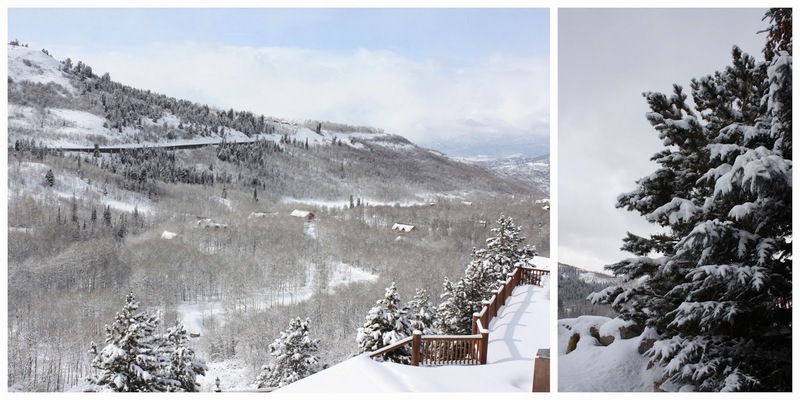 I&#39;m just now returning from a trip to those beautiful snowy mountains — it was heaven! And what a wonderful friend to knit you a pair of socks — that&#39;s a lot of work! This sounds like a fantastic weekend. I&#39;m fascinated by the hexagon swap gift. Are they coasters? What is the gray item they are sitting on? It&#39;s actually a little travel sewing kit with pockets inside. I should have snapped a picture of the inside!